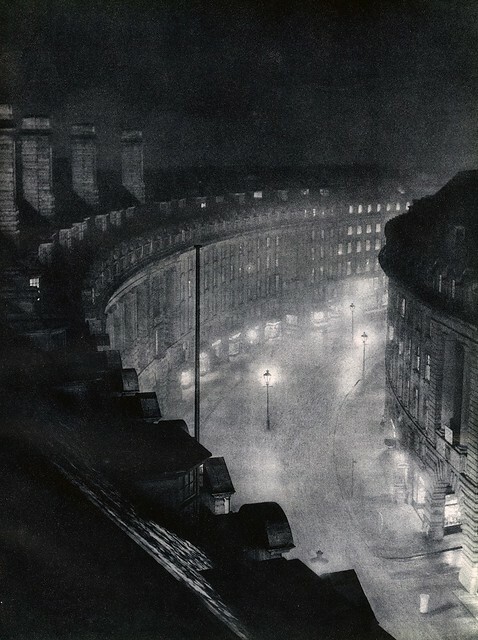 With his collaborator John Morrison, Harold Burdekin photographed the streets of the city of London in the dark for his book London Night, published in 1934. In a time before stricter air pollution controls, the pair chose foggy nights to make their images, giving the light in the photos a sense of weighty presence. As we penetrate the pea soup, we might recall that it was on this date in 1940, during the Battle of Britain, that the German Luftwaffe launched a massive attack on London as night fell. 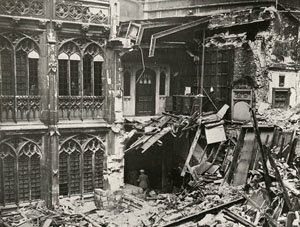 For nearly 24 hours, the Luftwaffe rained tons of bombs over the city, causing the first serious damage to the House of Commons and Tower of London. One year later, on this date in 1941, the day after the air attack on Pearl Harbor, Great Britain joined the United States in declaring war on the Empire of Japan.